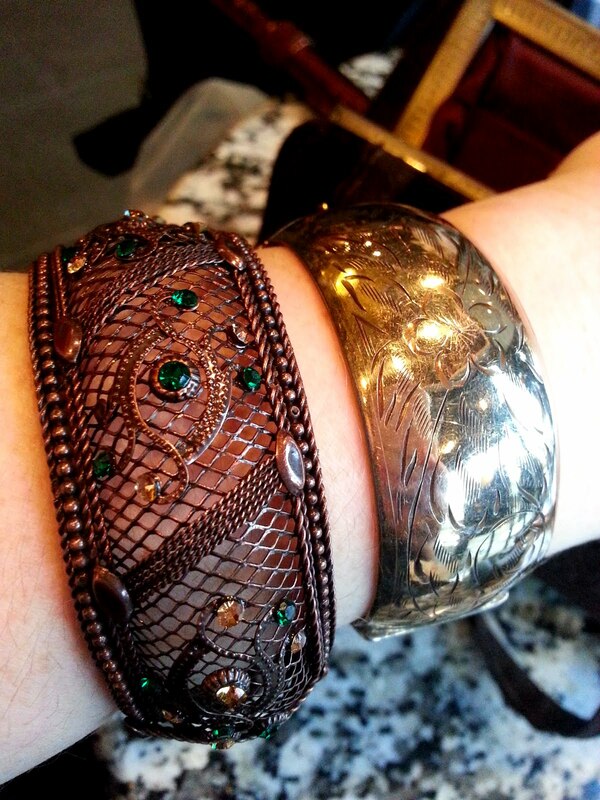 I was recently seduced by yet another piece of expensive jewelry. (In my defense, it was on sale for less than half price.) 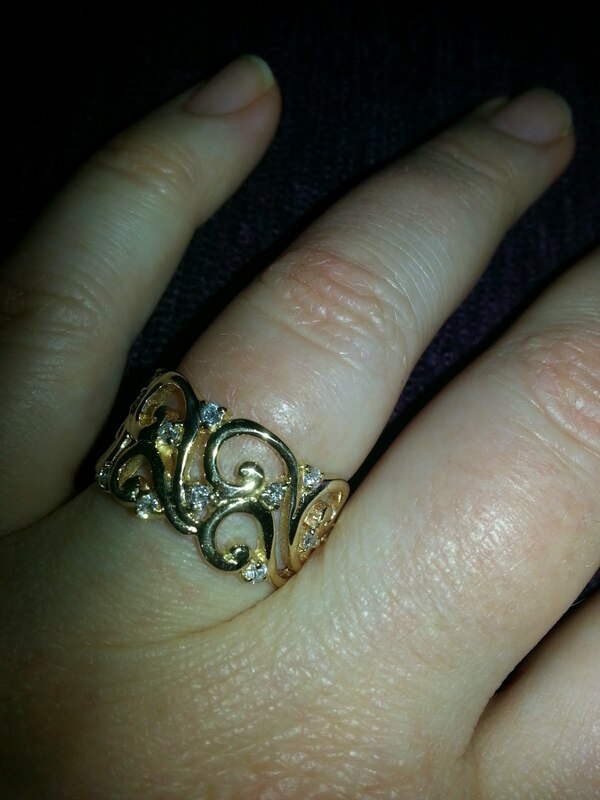 This time it was a gorgeous, curvilinear, gold and diamond ring. I'd been looking for years for one with lines like this so my first response to it was, "Where have you been all my life?" The first thing the ring reminded me of, quite naturally, was Van Gogh's famous, Starry Night. The vast, wave-like swirls, the sparks of light: the resemblance was, to me, unmistakable. 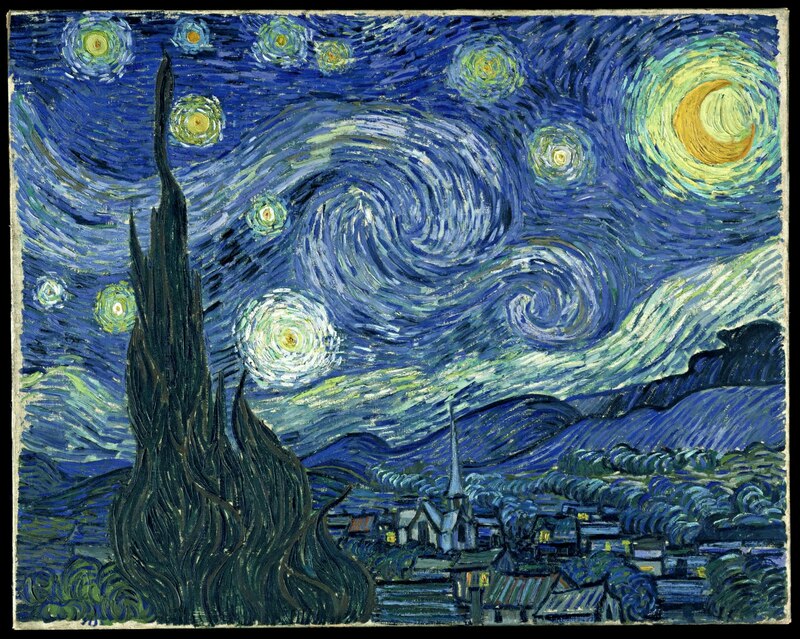 Sometimes the world looks to me as it did to Van Gogh on this night. To me, such moments are what the Romantic poets called sublime. 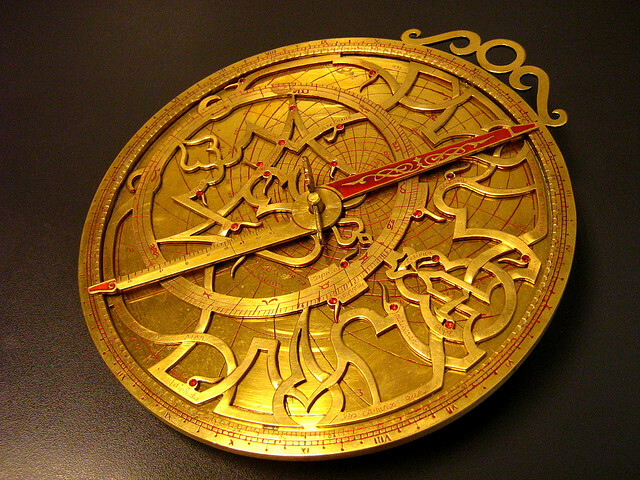 I was also quickly reminded of an astrolabe, a complex machine used since antiquity to chart the locations of the stars and planets and, therefore, also to navigate here on earth. They seem like works of art as well as works for practical use. Her coat here reminds me a lot of mine here. I've always thought Dee has amazing fashion sense so I'm pleased that I own something similar to what she owns. Around this time, my old friend Dee announced her engagement with this photo of herself on the day she got her engagement ring (which, natch, she and her fiance designed together). 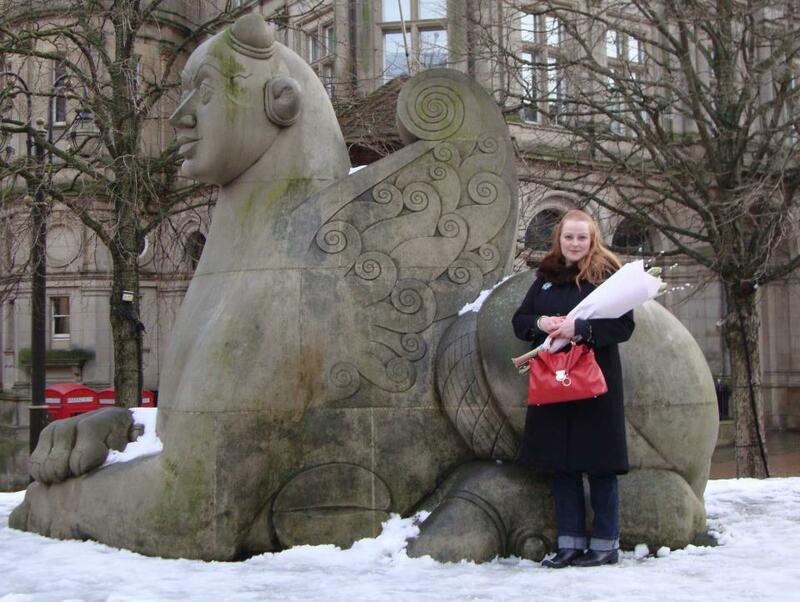 She posed in front of one of the Guardians in Dhruva Mistry's River Guardians, Youth and Object. Do the lines on the wings remind you of anything? They sure reminded me of something. 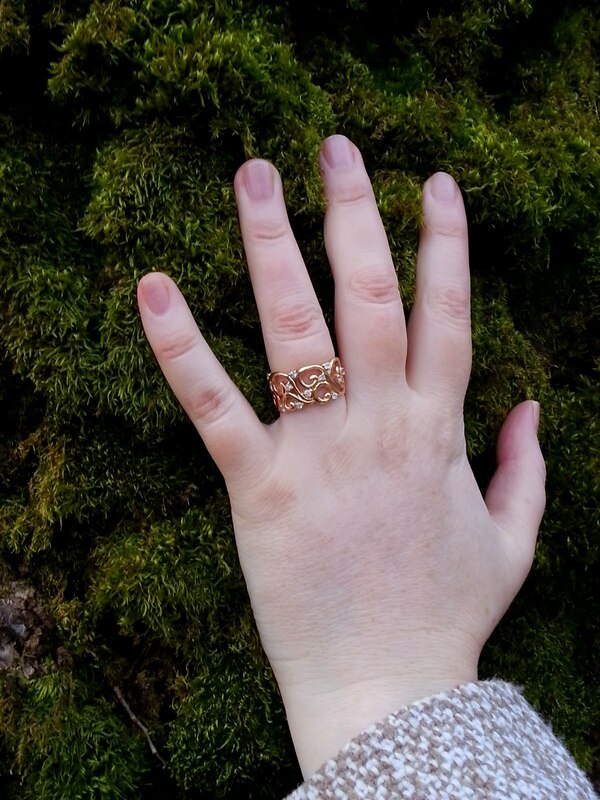 I decided to create a little blog post about all the wave-like imagery that my ring calls to mind. There was so much, I had to leave some of it out! 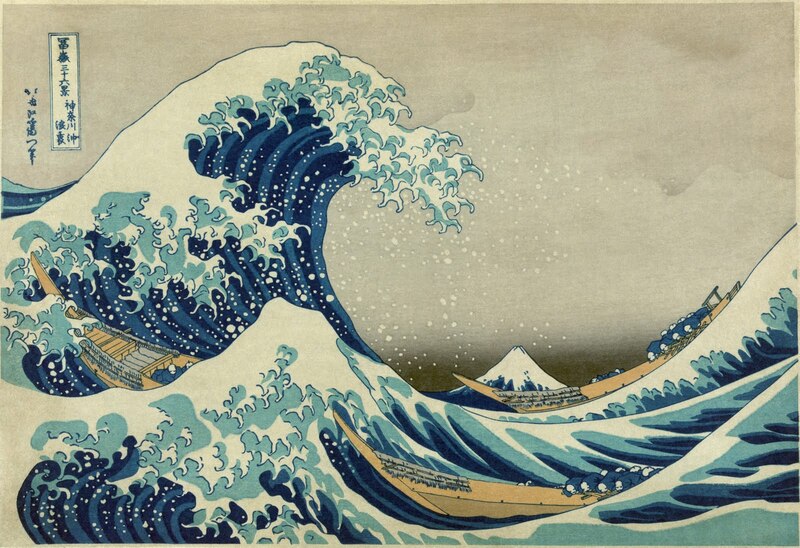 Of course there is the 1833 Great Wave off Kanagawa by Hokusai, which was later to have such a huge impact on Western art. The boats here are not dissimilar to the ones that Anlgo-Saxons would have used over a thousand years ago. The waves in my ring and the wave in this work call to mind one of my favourite poems of all time, which itself is Anglo Saxon and over 1,000 years old: The Seafarer. It is, not surprisingly, about a seafarer and his suffering at sea. What? You can't read it? It's not in English, you say? Actually, it is. This is what Old English (a.k.a. Anglo Saxon) looks like. I had to learn it during my Masters degree. Okay, I didn't have to. I wanted to. It was not easy but it was extremely fun and rewarding. Here's a translation of a passage from it that I love. The pathos and descriptiveness of it send shivers down my spine. "… My feet were pinched by the cold, shackled by the frost in cold chains, whilst anxieties sighed hot about my heart. Hunger tore from within at the mind of one wearied by the ocean. This that man does not understand, who is most agreeably suited on land - how I, wretchedly anxious, have for years lived on the ice-cold sea in the ways of the sojourner, bereft of kinsfolk, hung about by ice-spikes; hail pelted in showers. 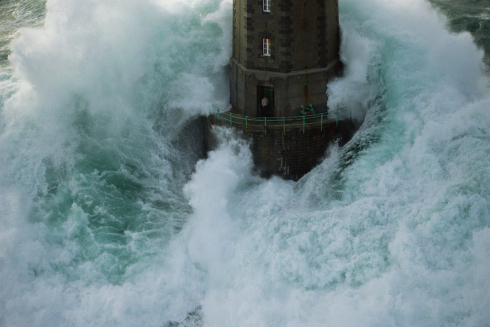 There I heard nothing but the raging of the sea, the ice-cold wave. Sometimes I would take the song of the swan as my entertainment, the cry of the gannet and the call of the curlew in place of human laughter, the sea-mew's singing in place of the mead-drinking. There storms would pound the rocky cliffs whilst the tern, icy-winged, answered them; very often the sea-eagle would screech, wings dappled with spray. No protective kinsman could comfort the inadequate soul…"
"The Spirit did not tarry here, but bade Scrooge hold his robe, and passing on … sped—whither. Not to sea. To sea. To Scrooge's horror, looking back, he saw the last of the land, a frightful range of rocks, behind them; and his ears were deafened by the thundering of water, as it rolled and roared, and raged among the dreadful caverns it had worn, and fiercely tried to undermine the earth. 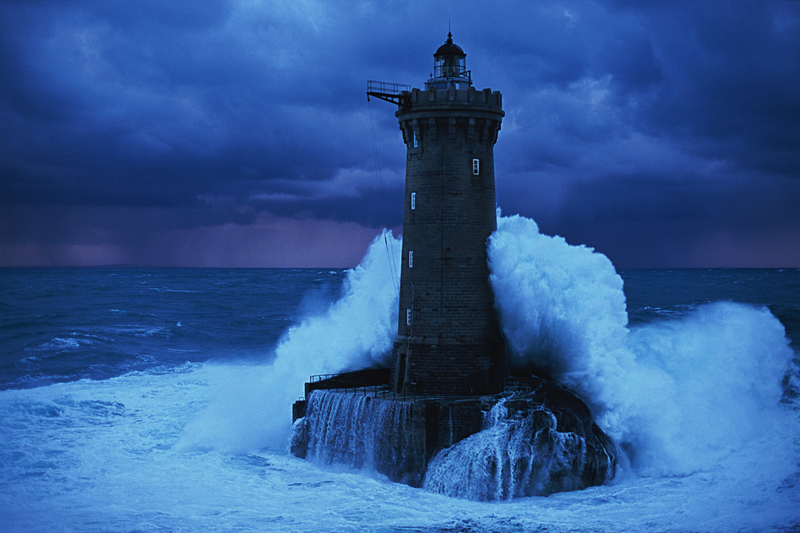 "Built upon a dismal reef of sunken rocks, some league or so from shore, on which the waters chafed and dashed, the wild year through, there stood a solitary lighthouse. Great heaps of sea-weed clung to its base, and storm-birds—born of the wind one might suppose, as sea-weed of the water—rose and fell about it, like the waves they skimmed. "But even here, two men who watched the light had made a fire, that through the loophole in the thick stone wall shed out a ray of brightness on the awful sea… [and] struck up a sturdy song that was like a Gale in itself. 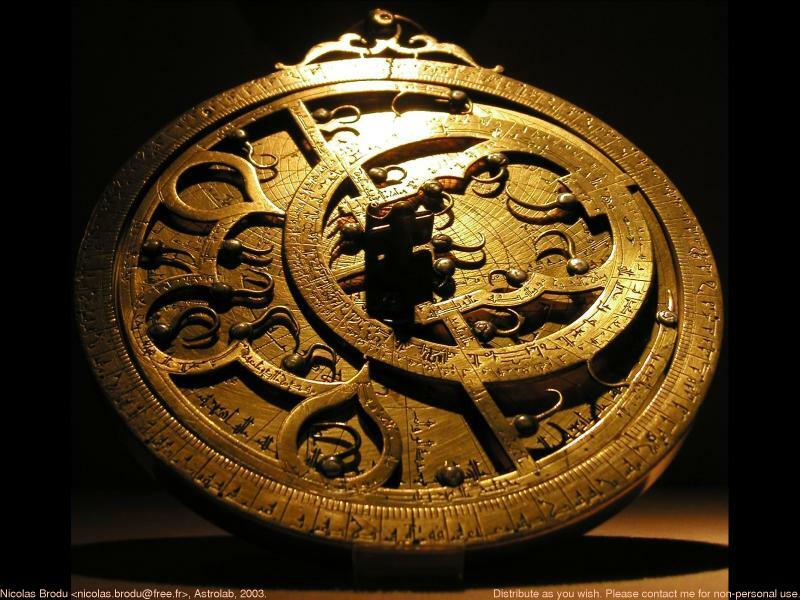 "Again the Ghost sped on, above the black and heaving sea—on, on—until, being far away, as he told Scrooge, from any shore, they lighted on a ship…"
All this talk of the sea makes me think of that great sea navigator again, the astrolabe. Which looks an awful lot like my ring, does it not? To me it does. My ring's swirling curves also make me think of Medieval illuminated manuscripts, the most beautiful of which are full of swirls and curly-qs and other beauties. The one above is in Hebrew and I'll admit that my Hebrew is far too rudimentary for me to translate the above, though I can read some of the words. Care to help us all out? When I was a child, I would sometimes read books that were lined with paper that I realize now was reminiscent of illuminated manuscripts. 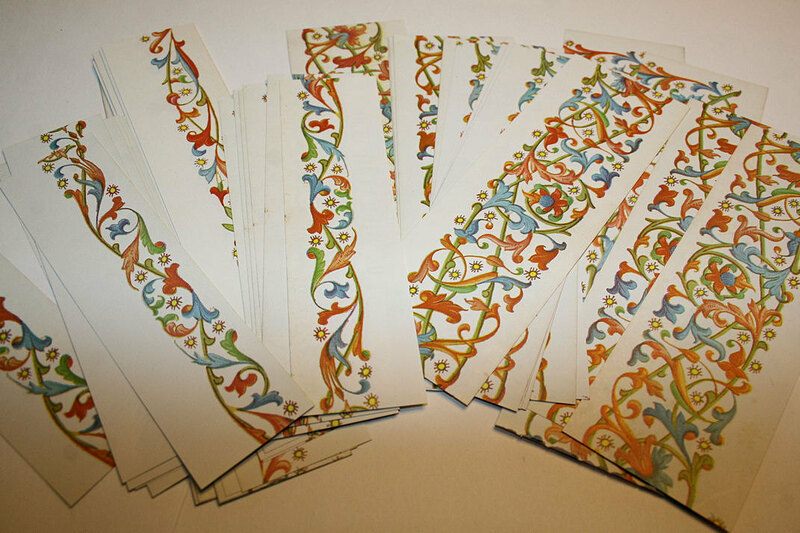 I had a favourite writing paper that was edged with such designs. I saved that paper to write letters only to the people I loved the very best. 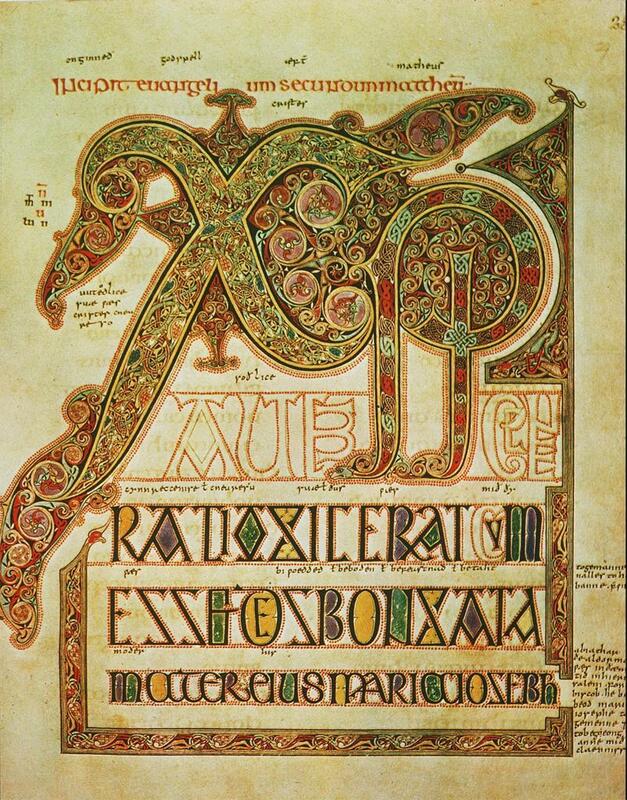 My friends who are Medieval scholars tell me that the mother of all swirly illuminated manuscripts is The Lindisfarne Gospels. It was made in about 700 C.E. (Common Era, a.k.a. A.D.) and its creators were obviously influenced by Celtic art. It's a thing of beauty, no matter what your religion or ethnicity. 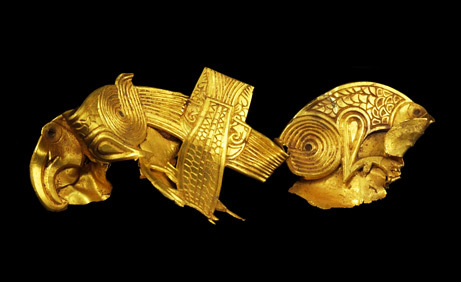 Speaking of Anglo-Saxon and Celtic art, did you know that a whole new hoard of gold was unearthed on a farm in Staffordshire, England a few years ago? All of it was used for military purposes. This piece is apparently called a "zoomorphic mount," whatever that is, and it depicts eagles. That's hard to see, I think, but what's not hard to see are those swirling lines that are the theme of this post. Its beauty is easy to see too. 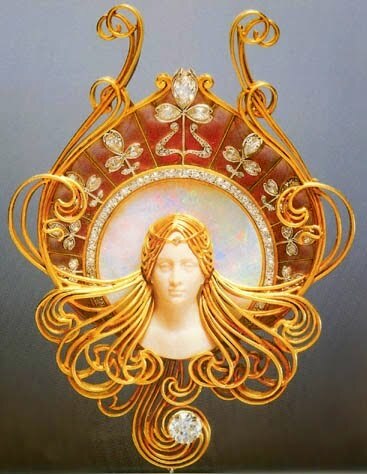 And as we think of swirling, wave-like patterns in gold, we jump over a thousand years ahead in time to about 1905, to one of the most iconic images of Art Nouveau: the lovely, slightly plump, wild-haired woman. ... her hair whipping about her in swirling, wave-like patterns, a decoration unto itself. 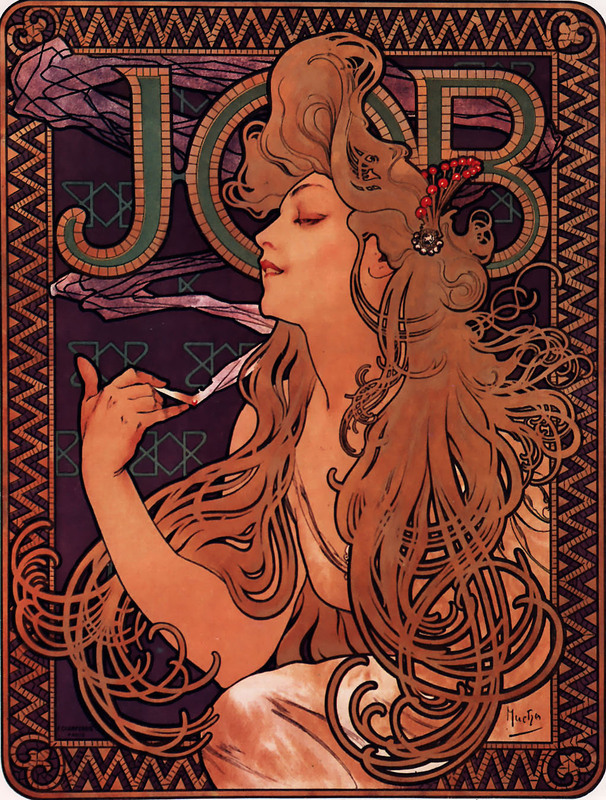 But probably the best known of these images are by the decorative artist Mucha. His work is still very popular. Here, he is advertising Job cigarettes. Anyone who ever rolled her own joint knows about Job rolling papers, right? 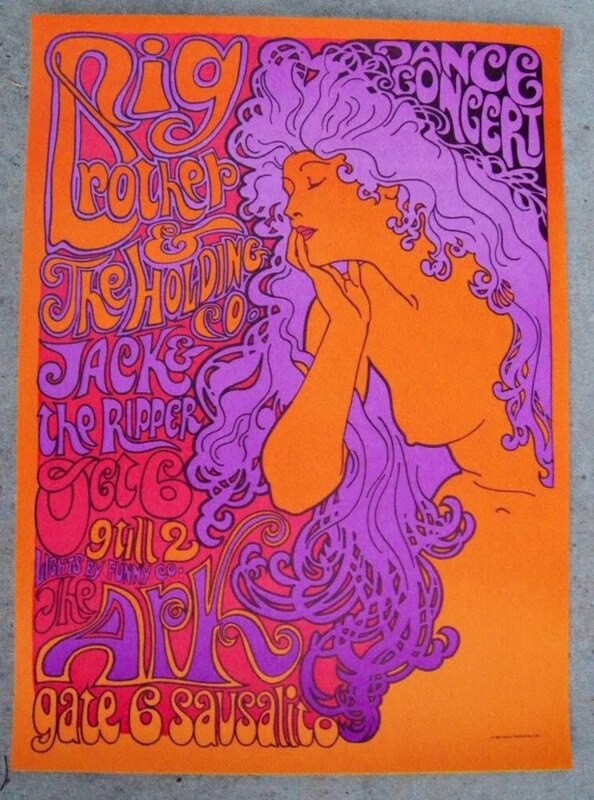 Is it a mere coincidence then that Art Nouveau was copied, nay, plagiarized in the 1960s for concert posters? Art Nouveau had fallen out of favour, but the hippies loved it. Indeed, when I was in my late teens, and still crawling out of my own hippie upbringing, I scraped together a little money and bought these two silver knock-offs of Art Nouveau jewelry. I'd recently left a very rough home and was pretty alone in the world (which may be why The Seafarer's loneliness appeals to me so much). These rings were like talismen (taliswomen?) or guardian angels or something. They made me feel less alone and frightened. I wore them all the time... until I got a tattoo, but that's another story. If you have pots of money, you can actually buy some of the jewelry here at Adin. Even now, I am a sucker for these curving, organic lines. 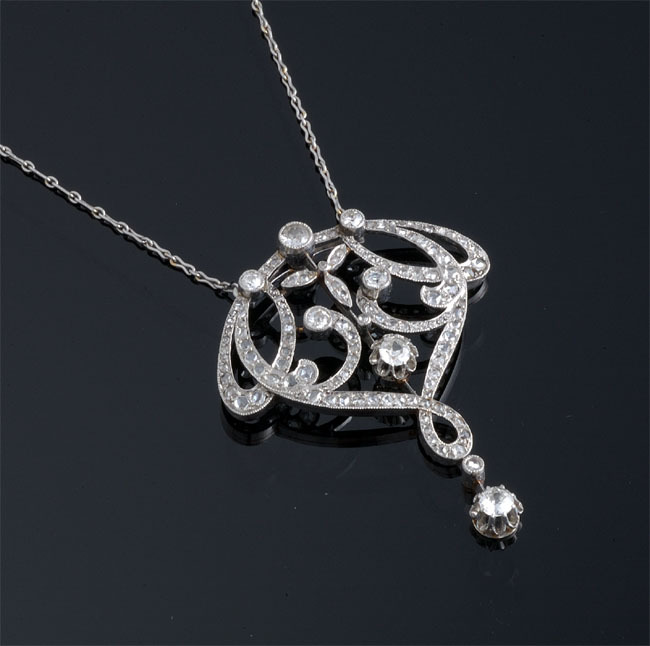 I think I would be giddy for a year if I owned this Edwardian necklace. 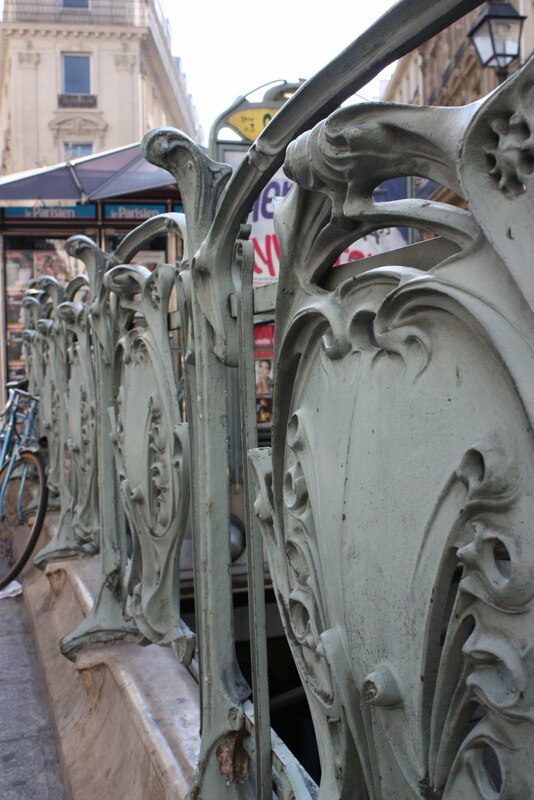 And the architecture of the Art Nouveau stops on the Paris Metro are something I hope some day to behold. Of course, architecture is always influenced by art movements. 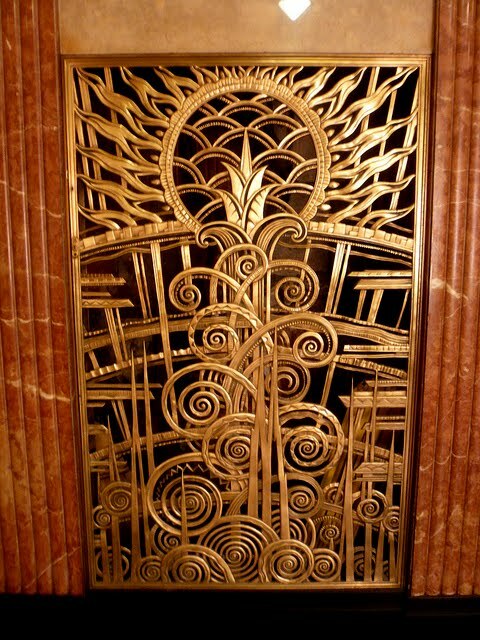 The Chanin Building is probably my favourite building in Manhattan. I used to walk to the furthest subway exit on my way to work, just so I could exit out of this building. 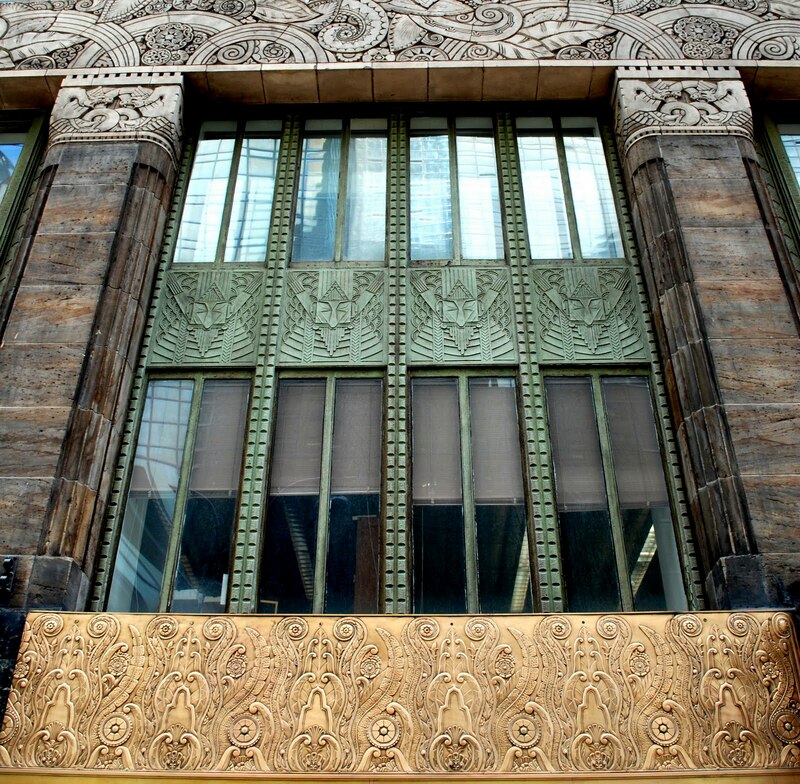 The geometry of this building reveals that it is Art Deco which was, itself, a reaction against the overly ornate Art Nouveau. Yet it still holds a lot of the lines we've been looking at throughout. And why wouldn't it? They're beautiful. If I remember correctly, this grillwork is at one of the entrances to the building. I have some photographs of it which I took with a really old and really crappy camera. When I left New York, I didn't want to remember much but I did want to remember this building. Such beauty: modernist geometry, the lines of machinery and skyscrapers, combined with those beautiful waves that make me think of my new ring. 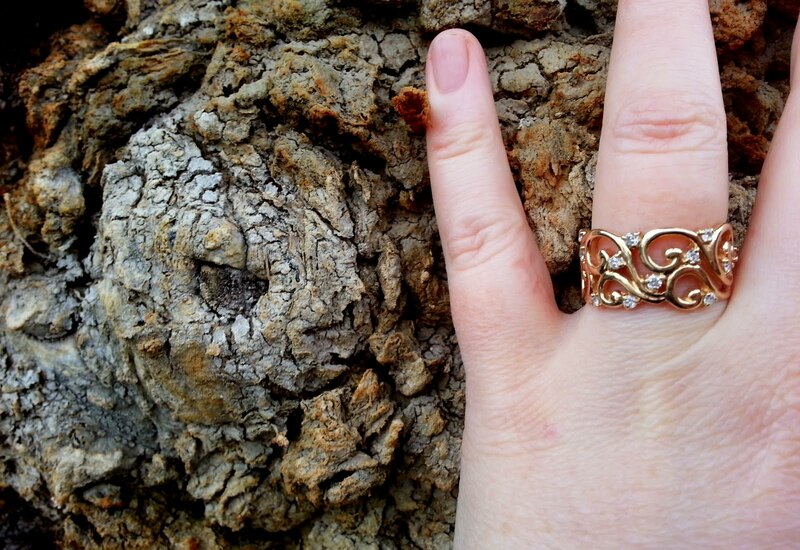 My ring arrived from sizing on the very same day that I suffered a really bad "setback" with my back. I was in a lot of pain and couldn't get out at all but a sweet friend (who happens to have a PhD in Old English) went downtown and picked it up for me, just to make me feel better. A few days later, Beau took me out to a cafe. 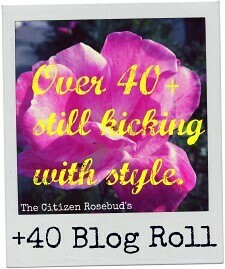 It was painful just to get in and out of a car and I was using my cane again. 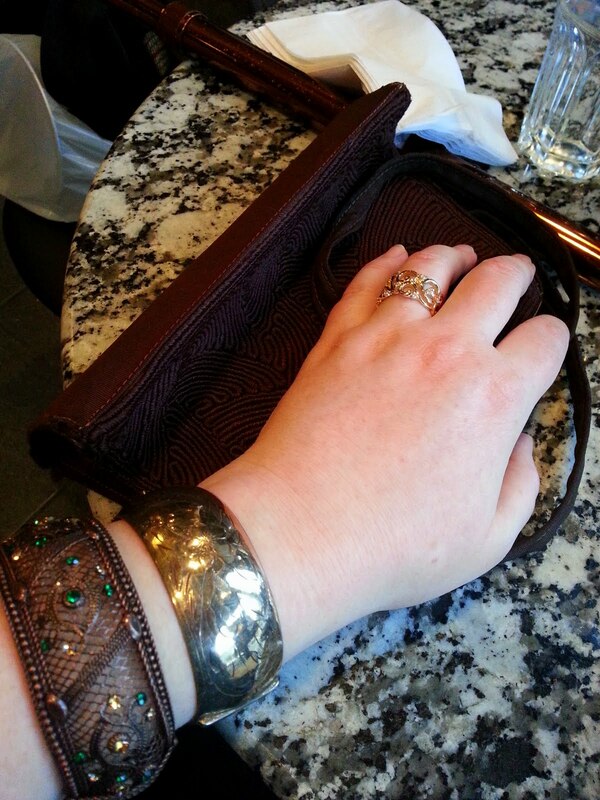 ... and wore bling to match in colour and design. See the swirls? Now that you know all the things my ring reminds me of, is it any wonder it cheered me up? It makes me feel part of a long long line of art, architecture, fashion, and literature. I flatter myself, but it helps with the pain, so why not? 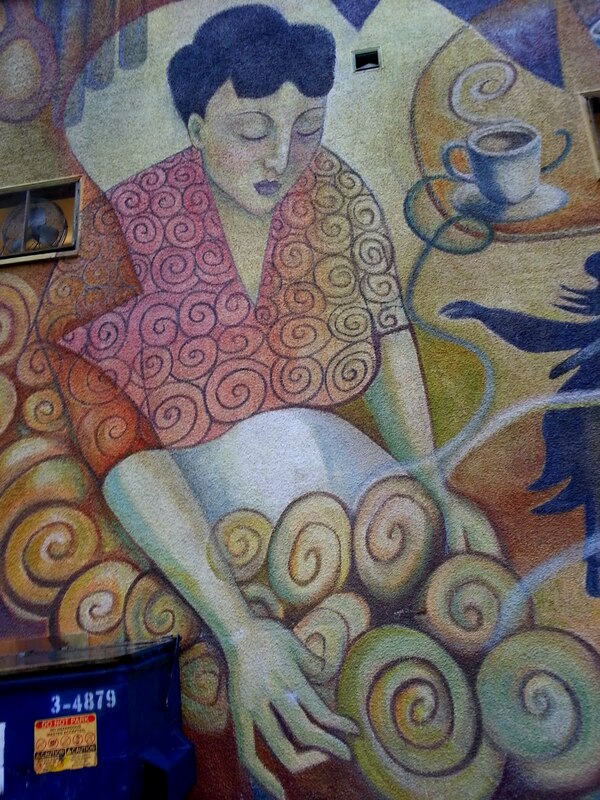 And as I hobbled out of the cafe and around the corner, for the first time I really noticed this mural on the wall of the best bakery in the neighbourhood. Beautiful!And by the way, 'zoomorphic' refers to animal shapes, particularly those in Celtic art where the swirling lines suddenly turn into animal heads or feet or wings. Thanks! I figured I knew what "zoomorphic" mean (like the opposite of anthropomorphic, I assumed) but what the "mount" part of the word meant was where I was and am a bit lost. Do you know? I'm somewhat of an expert on Art Nouveau and a complete Mucha fangirl. Needless to say I love your jewelry. 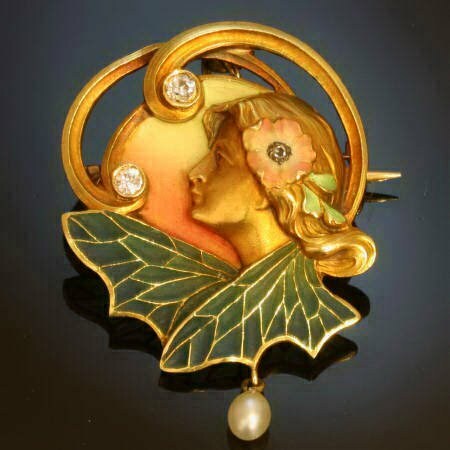 Art Nouveau was born out of a need to reintroduce natural organic lines after the linear simplicity of the Arts and Crafts movement. 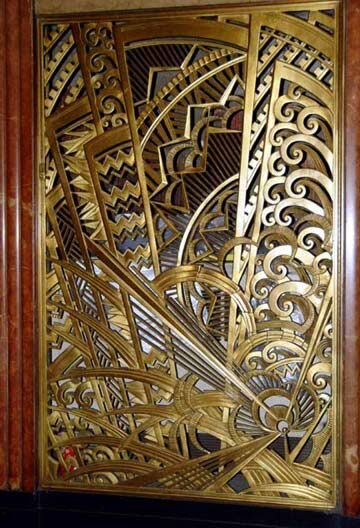 Art Deco was a move back to Arts and Crafts while retaining some of the fluidity of Art Nouveau. Oh, Spash, I wish all this jewelry were mine! If you read the post, you'll see that only the rings are my own. I think all three of the brooches and the necklace are from Adin, which I love to look at. That does mean they're all for sale... if you have the cash. I do love the Arts and Crafts movement too and these two movements overlap in time a bit. My home is a mishmash but mostly inspired by the 1930s, Arts and Crafts, and Art Nouveau. I'm going to create another post about the same wavy lines but with photos from the antiques in my home. What a beautiful ring, and such a beautiful way of thinking through the artistic lines to which you are now (but really, always were) connected... 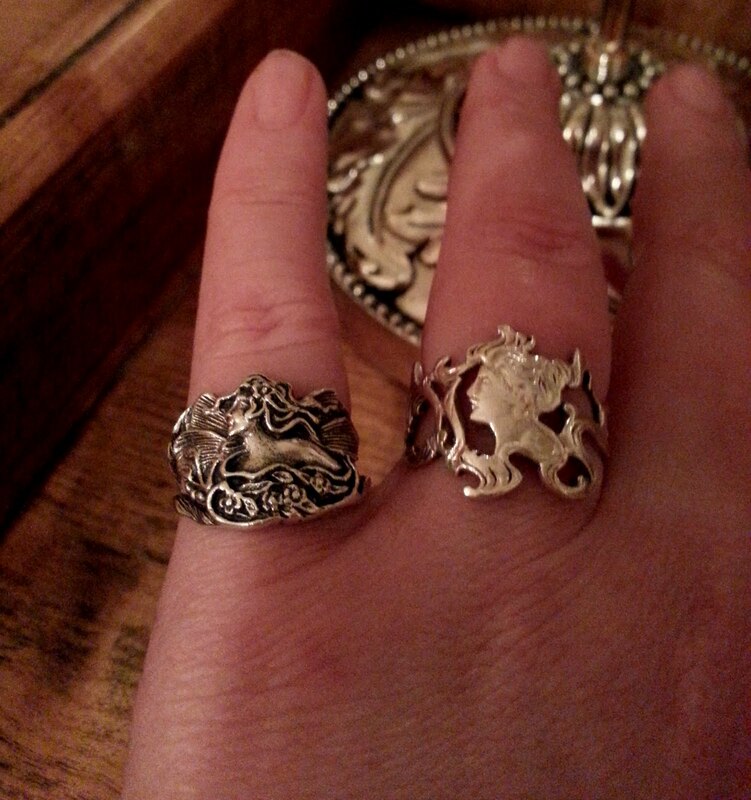 I am super envious of the two "silver knock-off" rings that you bought in high school! Those are amazing...do you still own them? Also, how did you acquire that writing paper that you have, that you only send to those whom you love most dearly? I am envious of them indeed! To have people in my life who still valued the written word, the _act_ of writing, as much as the content, the tangibility of it...and oh, the beauty of good stationary, especially self-made! Your entry is very moving to me. Alas, I don't still have the writing paper. (The photo I posted just resembles it.) Someone gave it to me as a present when I was a child. I do still value the written word, though, which I should, since I teach literature at the college level. This includes the hand-written word. For journal writing, I still need paper and pen. I just can't type out my feelings properly. I write like I breathe: with ease and by necessity. Glad you're moved by my post. Hope you like some of the others too. Nice ring you got yourself :-) wear it in good health for many years to come. And thank you for the recommendation to Adin, it's much appreciated! 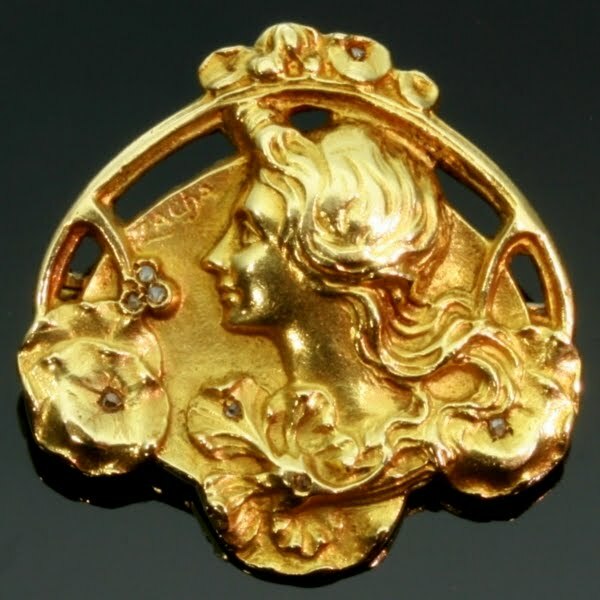 Whenever you make it over here in Antwerp, you are more than welcome to pay us a visit and we'll have a nice time discussing antique jewelry and the old styles. Kind regards and have a great weekend! That's funny! What kind of design did you study?